The sun shone and it was just warm enough to get outside and enjoy the garden. Rita the lady gardener went to the garden centre (her favourite place...) to buy some bedding plants for us to put in to the raised beds. We thought we might have left it a bit late, what with the Jubilee and all the rain we've been having, but there was still a good display. In shady areas it was still really quite vivid. We did our usual tour around Wolferton and stopped to admire the old station. Harry pointed out that when the King died his body would have been taken from there by train to London. We then drove around the scenic drive spotting squirrels before stopping at the visitors' centre for refreshment. Harry's daughter Jill and husband David were following behind in their car and were a great help ferrying ice cream from the kiosk to the bus. On the way home we took the back roads past the Royal Stud, through Anmer and Houghton. We went up the drive to Houghton Hall and admired the Hall and the pond but the deer were a bit too far off to see well. We got back just in time for tea. Gary was coming after tea to do Tai Chi and what with movement to music in the morning it was a busy day. Just before we set off Keith Osborne the photographer doing the photos for the new website, came to take a snap of the happy party! Keith is a man of many talents and has helped design the new logo and sign. 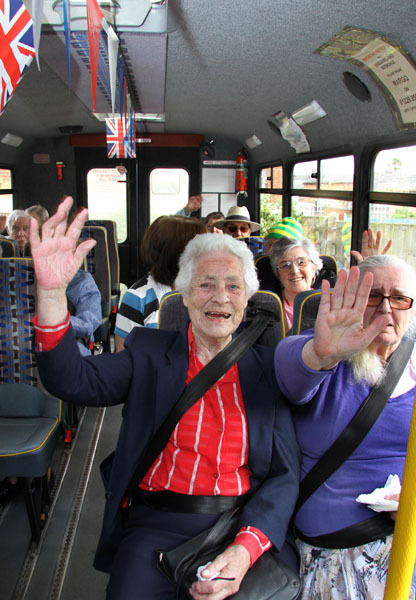 Thanks to David who came along as bus conductor. We had lots of fun. Thanks to everyone that helped and made it such a special day with special mention to Pearl for the wonderful tea, Rita for the flowers and Vicky for all those crowns and other colourful arty bits and of course to everyone that came and made it such an occasion. The Royal masks caused a lot of hilarity. We finished with a rousing God Save the Queen and 3 cheers. 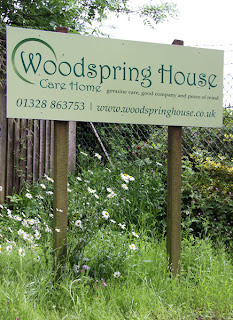 “Woodspring House was the original name for the house and we have always preferred it to Albany House. With the recent completion of extensive refurbishment work we felt it was a good time to change the name and mark the start of a new era. The values for which Albany House is known and that have enabled it to become so well loved by the residents and families that use it, however, will remain exactly the same under the new name: it’s homely atmosphere, genuinely caring staff and the peace of mind that families have of knowing their relatives are so well cared for”. 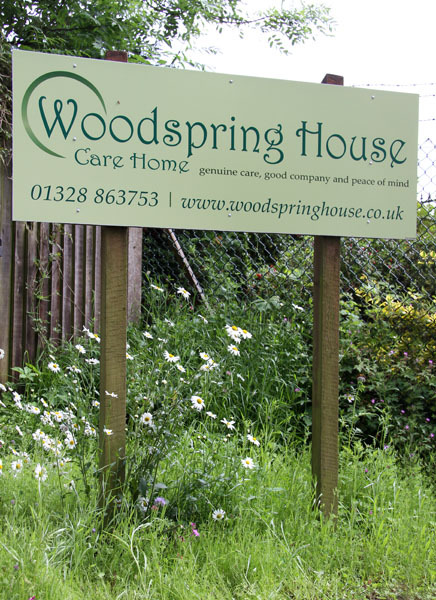 To go with the new name, Woodspring House will be launching a completely new website in the near future. In the meantime please continue to use www.albanyhouse.info. Until the new site is complete, you can also continue to find our latest photos and news on our blog atwww.albanyhousenews.blogspot.com. As promised Rita came to do some Jubilee flower arranging. The centrepiece was a plaque with '60' picked out in flowers.